"Total provided glassware, tablecloths and a cake knife for our wedding on Saturday and we just wanted to say thank you for the service you provided; there were no problems at all and you were a pleasure to deal with. Would highly recommend"
"Very fast and efficient service. Driver very courteous, helpful and chipper!" "We used total for our wedding back in 2010 & it was seemless, needed a small order this week for my sons christening, again really easy to order everything arrived & collected on time. Definitely be back when I need another party. Thank you"
"Just wanted to say thank you very much, on behalf of Taste of the West, for your help in organising the hire of equipment for the Taste of the West awards ceremony. My requests were dealt with very efficiently, even though I kept changing and adding to my original list! I am grateful to you for your help"
"Just a quick message to say what a friendly and helpful delivery team you have. Many thanks." A lovely message we received, well done to our drivers. "Many thanks to Total Event Hire. We had tables, chairs and table cloths, all delivered on time, all excellent, and a big thank you for being very patient when I amended the order a couple of times. Excellent personal service." 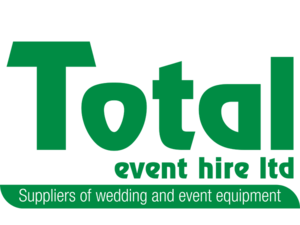 "Brilliant service from Total Event hire ! We hired chairs for our wedding and they were fab! They looked great, were competitively priced and delivered on time as stated on booking ! Thanks so so much." "Your products did everything I wanted of them and your service was perfect." "I would just like to say how much I appreciated the great help provided by Emma in your office during the long planning period and the team we saw so much of at the Cathedral during this last week. Paul, Graham and Rob could not have been more helpful or more willing in all that they did in delivering and collecting the large range of items we hired for this event, with its full share of logistical complexity. For Fridays collection we had hoped to have everything positioned for loading but failed so your guys just got on with it; locating the items and moving them to the vehicles for loading. I would be most grateful if you would pass on my sincere thanks to all your staff involved in this highly successful event"
"Just a note to say thank you so much for your smooth ordering, excellent service and swift delivery and collection of items for our wedding reception at Stokeinteignhead Village Hall. We could not fault your service at all. You came highly recommended and we will definitely highly recommend you to others." "Ron Cross, our Chairman, has asked me to write and thank you for the excellent service you provided again this year. Your staff are always so helpful and nothing is too much trouble for them, which always makes our job of setting up the Show much easier"